Bali is special. Think of the island as one big cultural festival of art, performance, architecture and ritual. Everywhere, everybody seems intent on turning everyday experiences into an artistic activity. Every house has a temple marking a daily connection to a rich, eclectic form of Balinese Hinduism. Women weaving, men carvings stone, villagers gathering for a temple festival with leaf sculptures, decorative cloths, food offerings, and a gamelan (gong, xylophone and drum) orchestra. Dance dramas abound—whether recreating scenes from ancient India’s classic Ramayana to Bali’s own indigenous Rangda and Barong masked dance. Our group settled in Ubud, Bali’s artistic village, at two fantastic hotels—with spacious villas, private pools, and inspiring views of Bali’s rich, tropical, well-forested fertile landscape. 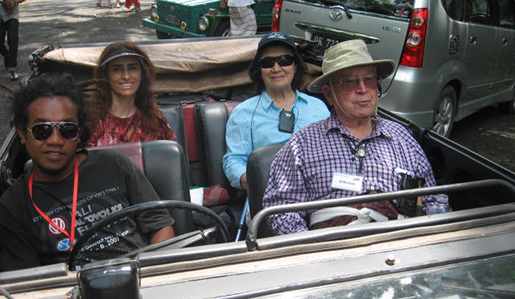 Some of our travelers rode elephants, while others rafted down the Ayung River, bounding along the white water rapids. 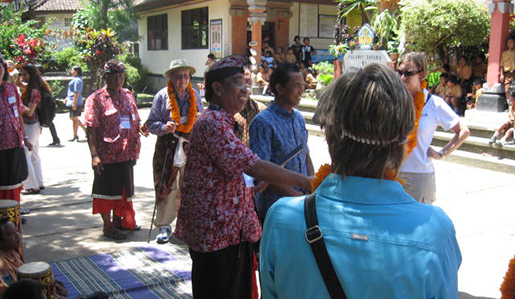 Most visited a butterfly farm, the Batukaru temple up in the mountains, and then visited a local school. The butterfly farm proved especially interesting. A tremendous variety of Balinese butterflies are bred there—many with interesting colors and patterns and sizes—the larger ones as big as the span of an outstretched hand. We also saw adaptations of beetles and grasshoppers and other critters that mimicked various branches, leaves and other plant parts apparently to avoid predators. At the temple we saw Brahmin priests—albeit on a lunch break in the sacred sanctuary of the temple that houses the sculptures of deities. 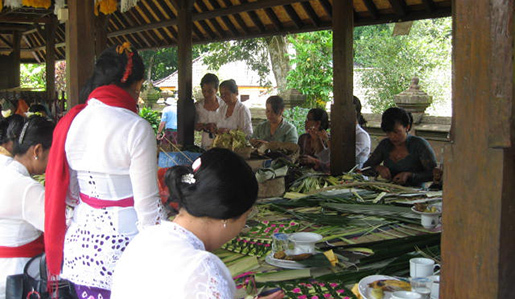 Village women were weaving temple decorations from palm and leaves, while Balinese visitors were making offerings, some after having ended the grieving period for dead family members. Wearing a sarong is mandatory for those visiting the temple—our group included, and we did the best we could—looking like a somewhat rag-tag bunch, but nonetheless one respectful of local tradition. After the temple it was off for an open air ride in Volkswagen 4-seaters up and over the ridge to another valley and Jatiluwih where we visited an elementary school. Teachers greeted us with huge garlands formed of scores of giant marigolds as young boys played in a gamelan orchestra and the school girls danced. One of our group wisely noted that the gamelan orchestra is kind of like Mickey Hart’s drum circle, with people playing percussion instruments and finding their harmony and rhythm. We distributed backpacks filled with books and school supplies to the school’s 150 students—part of the travel program’s philanthropic side. An evening program started with a welcome greeting by Don Washington, the public affairs officer at the U.S embassy in Jakarta and a talk by I Wayan Dibia, a native Balinese dancer, choreographer, and professor, who earned a PhD in ethnomusicology decades ago at UCLA with support of a Fulbright fellowship. Dibia, Don, and I worked together on a Festival of Indonesia program in 1991 that brought more than 100 Indonesia artists to the National Mall in Washington, D.C. for the Smithsonian Folklife Festival. It was a lovely reunion, and demonstrated how links between the Smithsonian, the State Department, American institutions, and local ones—in this case Balinese, help build important relationships for educational purposes—and help make friends around the world too! The finale was a dance performance by a Balinese group in an over-the-top setting at the hotel. Led by torch bearers, we entered a Balinese outdoor courtyard with characteristic architecture and friezes, lit up with lights and a bright spring moon. We enjoyed a lovely meal and a colorful dance performance. While Kyoto’s pavilions and gardens, and Nara’s temple represented oases of peacefulness, contemplation, and traditional culture in the midst of a sprawling industrial society, Bali by contrast, save for its capital Denpasar, is still mostly rural, and still offers an abundant and almost sensually overwhelming canvas of local cultural expression. Though there are many changes since I first visited Bali some four decades ago, it is reassuring to see how local culture is flourishing in both traditional and contemporary ways. Find more information about our Around the World Private Jet trips here. Dr. Richard Kurin serves as the Smithsonian Institution’s Under Secretary for History, Art, and Culture with responsibility for most of its museums including the National Museum of American History, the National Museum of the American Indian, the Smithsonian American Art Museum, the National Portrait Gallery, the Freer and Sackler Galleries, the Hirshhorn Museum and Sculpture Garden, the Cooper-Hewitt National Design Museum, the Anacostia Community Museum, the National Museum of African Art, the National Postal Museum, and others including the soon to be built National Museum of African American History and Culture. He also oversees research and outreach programs, including the Smithsonian’s Traveling Exhibition Service, The Smithsonian Associates, the Smithsonian Channel, and the Smithsonian Affiliates—a network of 168 museums across the U.S.